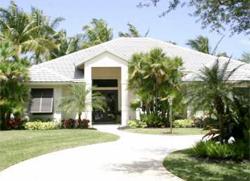 Heritage Oaks, located in Tequesta Florida just north of Jupiter, is a beautiful community with Oak lined streets. Heritage Oaks homes are known for their peaceful surroundings, sparkling lakes and large landscaped lots. The Tennis Club features well manicured tennis courts and a park for children. The residents of Heritage Oaks have to opportunity to access the ocean and waterways of Jupiter as the Eastern Boundary of Heritage Oaks are surrounded by the north fork of the Loxahatchee River. The community is also gated and has 24 hour manned guard gate. One of the most desirable places to live, Heritage Oaks is a popular choice for those looking into Northern Palm Beach County real estate. Homes in Heritage Oaks offers spacious floor plans ranging from 2,400 living s.f. to 4,200 living s.f., complimented with large, tropically landscaped lots. Some homes offer private docks with Intracoastal and ocean access. Pricing typically start around $550,000 and go up to $1,500,000. If you have any questions or are looking to buy or sell a home in Heritage Oaks, please give Preferred Residential Properties a call at (561) 747-8987.